LDPS NZ LTD have just completed one of their most adventurous projects to date, The Omaka Aviation Heritage Centre was officially opened on December 8, 2006, unveiling a unique visitor attraction and significant asset for the region. Entitled “Knights of the Sky”, the opening exhibition includes one of the world’s largest private collections of rare WW1 aircrafts that are presented in dramatic tableaux to spectacular effects. Grant Collie, Managing Director of LDPS has been working closely with the client trust for over 2 years, as Technical and Museum Consultant on the project. This project still has several years and phases to go, but Stage One, which opened in December, occupies some 3,000 sqm of purpose-built display area and accommodates a collection of dramatically-staged static displays of original and replica aircraft along with flyable aeroplanes from the WW1 era. The collection is managed by the 14-18 Aviation Heritage Trust, which is chaired by film director Peter Jackson, and has been brought to life in a series of theatrical dioramas constructed with the artistic talent and technical expertise of some of New Zealand’s most talented storytellers and special effects wizards. The project was unique in many ways due to its complexity and spectacularly short timelines from design sign off to opening less than 10 weeks !!!! The vision of the museum trust and it supporters, plus the backing of the local authority enabled the team to proceed ‘organically’, which gave a stunning result but caused many sleepless nights for us all to meet the deadline. Aviation Heritage Trust CEO Jane Orphan and husband Graeme, along with Trust Chair Brian Greenall provided the support along the way for all concerned as well as all working tirelessly alongside the professional teams. Exhibition design was by Joe Blakeley for Peter Jackson’s WINGNUT FILMS and much of the construction was done by an army of Wellington’s finest set builders, painters and props people who took on the project between international blockbusters. Richard Taylor’s WETA WORKSHOP used the project to develop the most stunning lifelike, pose-able mannequins which should become an international standard for Museums and Attractions over the next few years. LDPS, under the direct supervision of its Senior Designer David Seaton, brought together a who’s who of NZ technical expertise to undertake the full technical design, procurement and installation both on time and on budget. Grant Collie LDPS NZ LTD Project Development and Procurement. David Seaton LDPS NZ LTD Crew Boss and Lighting Designer. Conan Richards LDPS NZ LTD Multimedia Design and Co-ordination. Rob Birch JANDS NZ LTD Soundweb Design and Programming. Onsite we were also joined by SpringCreek Engineering and main screens were supplied and installed by HERBERS. Making the project happen on such a tight timeline relied on the ability of our suppliers to work closely with us. The full equipment list is below, but several suppliers deserve special recognition. Italian Lighting Manufacturers, LDR, supplied over 2 Tonnes of CDM fixtures for the project – which was their first foray into the NZ market. LDPS were so impressed with the product that they have agreed to be their local partners and look forward to many more similar projects over the years together. Local audio specialists, JANDS NZ LTD, in the shape of Rob Birch – provided and installed the Soundweb control and also interfaced all of the supplied audio. SOUNDTUBE provided EASE analysis of the space and supplied relevant speakers for background audio and aircraft flythrough effects. GILDERFLUKE supplied the amazingly versatile but stunningly economical SD10 and SD25 MP3 audio repeaters, which were used extensively to provide both local and general audio content. CHRISTIE DIGITAL projectors were used throughout the project due to their inherent reliability and optical excellence. LDPS are the Christie Partners in NZ and were given great assistance by Christie Singapore. Additional lighting, cable, connectors and other bits and pieces were supplied with great enthusiasm by Chris MacKenzie at Kenderdine ElectricalKENDERDINE ELECTRICAL in Auckland. And finally, the tight deadline would have been impossible without Chris Edwards at GO LOGISTICS, who dealt with our urgent freight requirements from all over the globe with cheerful professionalism. The opening day was set, and LDPS had already had the two hangars fully carpeted in Black, the walls and ceiling painted black and over 1000 m of 48mm tube in two concentric rectangle formations at 6.5 meters with distributed power was already organised. This was in the words of Wingnut an “organic” production. The lighting rig had to be designed and purchased before a layout of the planes was available. Wysiwyg played an invaluable part in the design process, and helped keep the rig up to date as we went through 7 revisions of the groundplan. As this was a static display in a brand new venue with minimal staff. Running costs were a major factor in the design. This was not going to be any old hanger full of planes, these were 16 different looks one on each display. I wanted to have a theatrical feel to the rig, but had to combine that with high efficiency, low power bulbs. 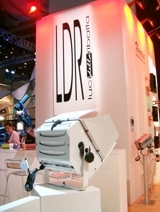 After researching equipment from all over the world, I settled mainly on the Architectural range from LDR. The design ended up with 70 150w CDM Fresnels, 24 150w CDM 20/40 Profiles, 24 150w CDM 12/28 Profiles, 15 Asymmetrical 150W Linear floods and 70 Symmetrical 150W Linear floods. Other equipment included 40 150w Altman 20/40 deg profiles, a CDM StarPar with a VSFX Moving cloud projector, and some MR16 Birdies. The plan worked. I used a mixture of 3000K and 4200K bulbs to warm or cool the scene as necessary. Some exhibits are over huge black and white photos , there is a snow scene, a muddy field scene, aerial combat scene, a trench scene, a crash scene. There are display cases, touch screens, 3 video screens. .Lighting was the major aspect of this project, but the range of other equipment is also worthy of mention. The project has only reached phase 1, over the next months and years we will be designing the lighting and interactives for a unique WW1 memorabilia collection and preliminary design for the remaining 2 hangers planned for the site. Prolight + Sound - International Fair of Technologies and Services for Events, Installation and Production.